What can you say when four long cycles of history all turn negative within the next 13 years? Dude, we are so doomed. 1. Peak oil, or the depletion end-game of the global economy's complete dependence on inexpensive, readily available petroleum/fossil fuels. 2. 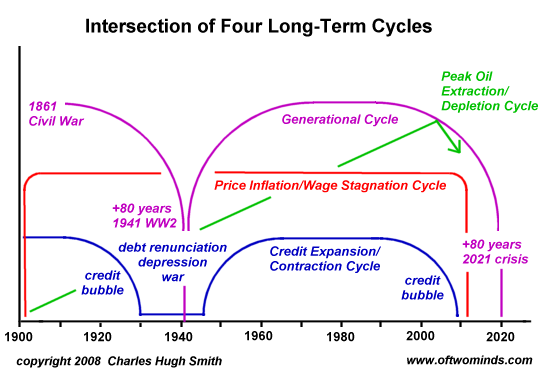 The cycle of credit expansion and contraction, which is now beginning the transition from unsustainable credit expansion (bubble) to renunciation of debt (credit collapse) and global depression. Refute any one cycle if you can--and there's still three left. Refute any two, and there's still two left. Any one of the four promises status-quo shattering consequences, and if you read all these books with any sort of objectivity then it's difficult to come away with the cheery certitude of the financial or mainstream press that "the worst of the (insert choice here--derivative, housing, Iraq, oil, etc.) crisis is past." Not so fast. Let's see how we're faring in, say, 2012 before we reach for the pom-poms and happy-talk. Or better yet, 2021--a mere 13 years hence. Given the convergence of historical cycles illustrated above and documented by the above books, I think it is safe to state--in the vernacular--Dude, we are so doomed. Re cycles: see attached Kondratieff figure produced in 1920s plus some notes I have added. From this, we could have predicted the 1920+53 = 1973 commodity peak. We can also predict the next 1973+53 = 2026 commodity peak. If the Iraq 'war' drags on beyond 2015, it is likely to intensify and then come to an ignominious but very emotional end in or around 2026. Speculators are rubbing their hands in anticipation! I experienced 1973 whilst I was a MOD procurement project manager; it was a wild time. Even Rolls Royce was nearly bankrupted. During the decade after 1973, the British Government more-or-less lost control of the country. I recently visited our 'National Memorial' in Staffordshire. The stone mason already has a massive backlog of work; he was chipping away next to a large plastic sheet which covered the outline of very many names. Thank you, Terence, for the charts and commentary. In 1957, after achieving top marks in the Armed Services Entrance Examination, he entered the Royal Military Academy Sandhurst. Commissioned into the Royal Electrical and Mechanical Engineers, he gained an Honours Degree in Electrical Engineering before serving in a variety of appointments in the United Kingdom, Europe and North America. Note: I receive no compensation in any form if you purchase a book from an author listed in the right sidebar. I list the authors and works because I believe they are worthy of your attention. Thank you, Cheryl A. ($25), for your unexpected and very generous donation via mail of the book The Great Wave by David Hackett Fischer. I am greatly honored by your support and readership.